There were good strawberries on Chesterfield market, and good value too. I bought a kilogram for £3 and an awful lot of oranges and mineolas to make up a fiver. Chesterfield has a good market for fruit and vegetables and the stall at the top corner has had at least two generations of loud voiced traders barking out, “Seven seedless oranges a pound. Just a pound your oranges.” It either attracts or repels depending on your mood but there is no disputing the quality. This stall-holder must be right at the front of the queue at the wholesale market in the early morning. I take a perfect cauliflower and a bunch of asparagus both of which practically smell of the field they grew in. That vital period of field to table is much shorter if you go to a good market than if you use the supermarket route. Within 24 hours all bar a few oranges have been cooked and either eaten or turned into jam. I like making jam. It has that lovely combination of history, simplicity and family. My grandmother made jam and so did my mother and her sisters. I’m sure great grand parents did but I’ve never traced the family back that far. It’s all so simple and full of good feelings and delicious smells that fill the whole house. It’s been a long time since I’ve made strawberry and it’s late by the time I set to. I simply halve the fruit once I’ve trimmed the tops. Then they go into the jam pan with the same weight of sugar. You can get special jam sugar but I’ve never found it worth the fuss and always use granulated. I can’t resist adding the juice of a lemon because I always add the juice of a lemon to jam. 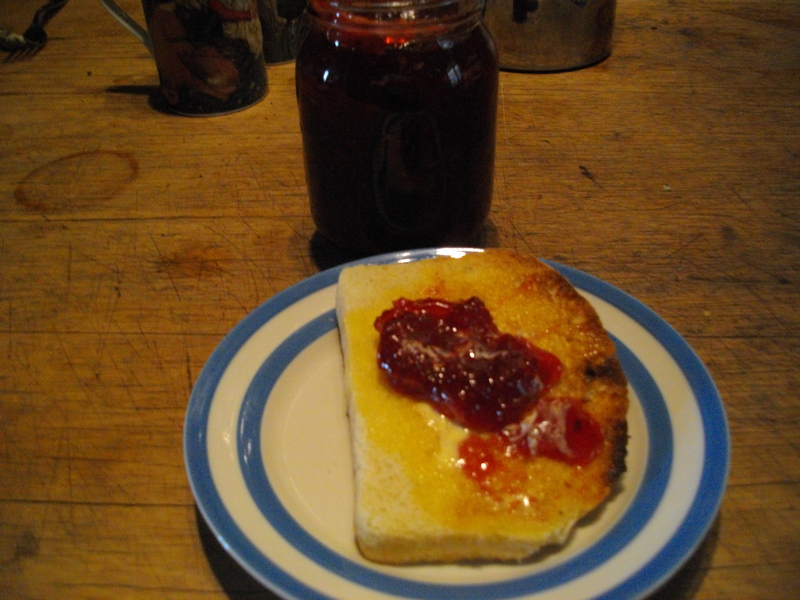 It’s partly tradition, partly that cooking with lemon makes me happy and partly that I have never bought jam better than the jam I make so why change a winning formula? Bring it to the boil. I don’t bother mashing the fruit (I rather like finding a substantial piece of strawberry in my jam) and I stir occasionally. Spotting the setting point is the skill or knack. I use well chilled saucers. I have a sugar thermometer but I don’t use it very often. My advice is to err on the side of too runny. If you let it go too far you will have produced a strawberry toffee that is almost impossible to get out of the jar. The whole process takes about 40 minutes and I’ve got two and a half large pots of strawberry jam all nicely jarred by bedtime and ready for my breakfast toast. Before I get to the jam and toast I use the asparagus. I poach the eggs and the asparagus in the same water; the asparagus for five minutes, the eggs for less than three. The toast takes three and the sauce is the remaining cheese sauce that wasn’t used when the market cauliflower became my all time favourite dish; cauliflower cheese. The breakfast is even better than the supper dish. I used to think that cauliflower cheese needed a rasher or two of bacon. Not true. Bread and butter is the perfect accompaniment; and someone you like a lot is the perfect company. It’s been a while since I made bread. Discovering a good bakery in the village has both spoiled me and denied me the opportunity of doing something I simply love doing. I don’t abandon the bakery entirely. I buy my bread flour there (and it is fabulous) and I buy my fresh yeast there as well. It is years since I’ve used fresh yeast and I want to punch myself. Instant yeast is pretty good these days but it isn’t as good. Fresh yeast is also easier to use. Another benefit of fresh yeast from our bakery is that they haven’t gat a scale and two ounces paid for is often nearer six ounces in the bag. One day last week we see a mature couple sitting on the bench on our dog walk eating rather good looking pizzas from their cardboard boxes. Domino has just opened a branch in the village and we thought we’d save ourselves some cooking. The sun was shining, the garden felt inviting, we’d got cans of coke in the fridge for when Charlie and David come round. It is the first time I have ordered pizza from a well known firm and (unless someone tells me they have connections with organised crime or are ripping down the rainforest (both of which are all too possible)) it won’t be the last. T has Vege-Roma and I have Anchovy and Jalapeño. It is the start of five hours in the garden eating, drinking fizzy pop and reading in the sunshine. One of the reasons I gave up the pay-roll and started working for myself is so I can take off all the sunny days as holidays. I’ve started very well. Chesterfield also served us up a decent vegetarian cooked breakfast. It’s up one of the many little alleyways that add such character to the town centre and gave us good cheer as well as well cooked mushrooms and eggs. Hot rolls very rarely last long in our house. These are exceptionally nice. The flour from the bakery makes brilliant bread. The fresh yeast rises well and you can just about taste it in the bread. The bakery is good; these are better. The fresh yeast rises better and faster than dried or instant yeast. The end product is much superior as well. 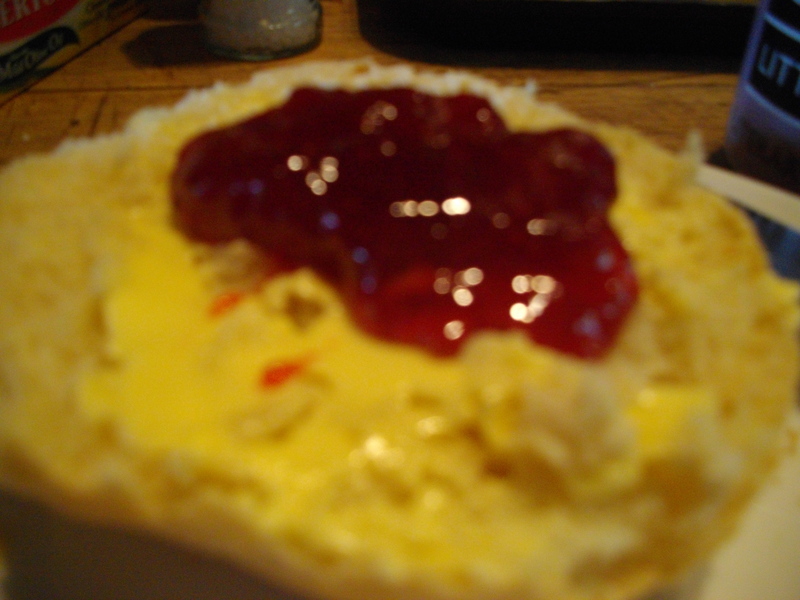 Mind you, the bakery has no competition from me when it comes to iced cream buns. I used to want a cigarette with my morning mug of tea. I think I must have been a bit stupid in those days. Cigarette or cream bun? No contest. Devilled mushrooms on toast to an original recipe. Thursday sees us back at the bakery for elevenses. I have the eclair, T has the doughnut. In his book on the history of Italian food John Dickie asks the question of what would have happened if the thirteenth century peasants had realised just how wonderfully well pears goes with cheese? The peasants grew the pears and made the cheese and sold them to buy the tiniest scrap of meat. The aristocracy in the meantime were eating the cheese and pears. Marx would have something to say about it. I simply indulge my passion. The challenge is simple. 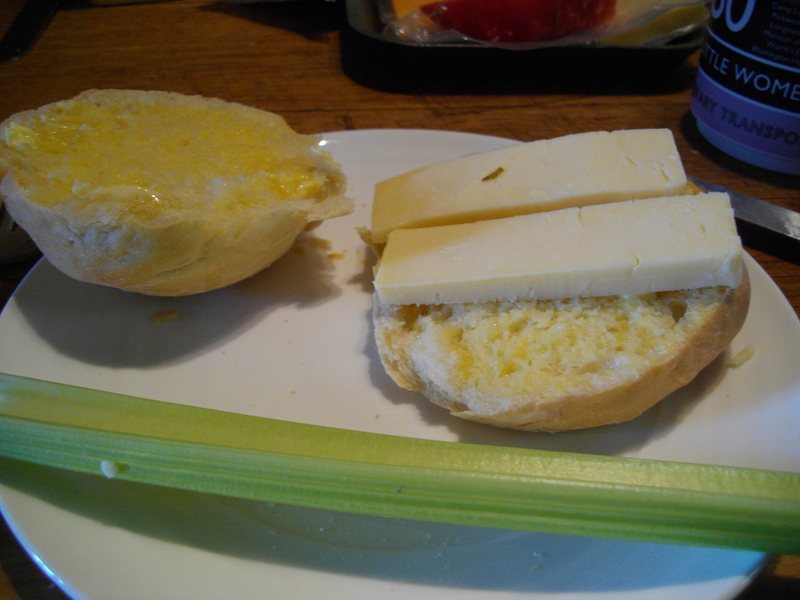 To find out which goes best with cheese; pears or celery. I eat for quite a while and consume more than my share of all three and conclude that I’ll just have to try again some other time. On Good Friday I’m up early to make hot cross buns. I’ve never made them before and follow Paul Hollywood’s recipe. At least I do for a while. He’s a heck of a good baker but his recipes are too fussy for me. I also cannot keep stopping to read the next bit. At the end I compare what I made with what he wrote and would be prepared to give him a 50% credit for the end product. They are superb. Four of us sit down to tea and not many hot cross buns survive the meal. It’s the start of the Easter weekend. We’ve got one child (hardly a child, he’s 24) back home and the other two coming round with partners. Plenty of good food on offer and the end of the Lenten fast. I’m rather looking forward to it. Did they intend some mischief upon me? One of them was astride a quad bike and a rather unfit fifty something on a bicycle might be a source of taunting fun higher up the slopes. Or even an easy way to fifty pounds. I would probably have given them that for a ride up on the quad bike. Was there some hidden danger lurking in the fells and flanks of the pass? An unfenced cliff? An unchained bull? A landslide that has blocked the road a hundred metres from the top which forces me to re-trace two hours pushing? Or were they just pleasant, friendly farm boys who knew just how long and steep the road is? It was this and no other. Dales folk are as honest and decent as anyone you can find and the more generations they’ve been in the dale, the more decent they seem to become. There are plenty of “quality of life” newcomers to the lower valley. Offcumdens, as they’re sometimes called. “Hello, we’re locals.” as they refer to themselves. This far up the valley it’s farms and farmers only. These are the true folk of the dale. The lads were quietly laughing at the silly old bugger with an over packed bike, waddling, red-faced on the nursery slopes, but, I’d bet last year’s salary that the same lads would drop everything and give over a morning if they thought I was in any real difficulty. The road is simply one of the best roads in Britain. The river stays with you for quite a while before revealing itself to be a true specimen. A geographer’s delight. The higher you climb, the easier it is to understand the mysteries of the water cycle. You just look at where everything is, what everything looks like an what everything is doing. Water flows downhill. 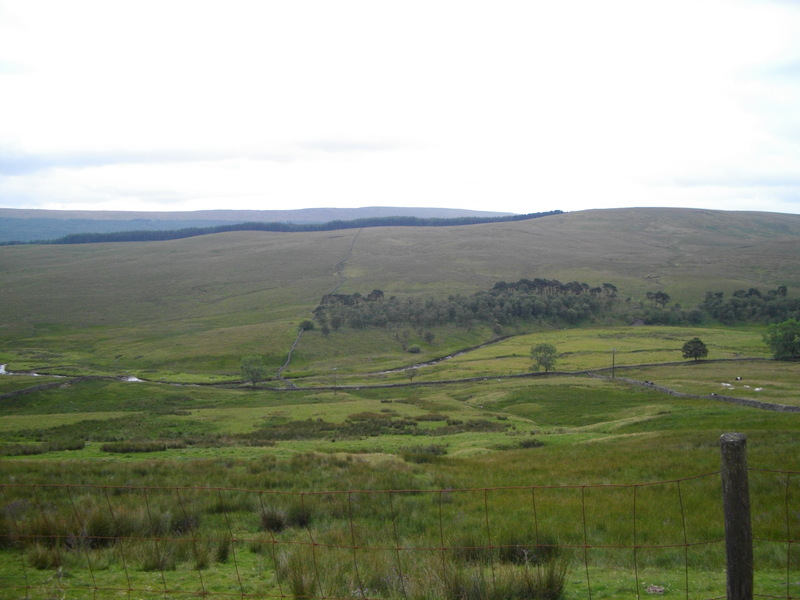 At the bottom of this hill is a maturing river and everywhere else are streams, marshes, little pools and lakes, tiny tumbling falls, evidence of flooding and of drought. the clouds mass overhead and sometimes the rain is simply deposited on the ground without even having to fall from the cloud. This would be a superb road later on in the trip when I’ve grown the legs. To do the whole mountain in the saddle would be an achievement. I have no idea how easy this is. I didn’t have the legs or the bicycle, and not a single other cyclist went past me all the way to the top. The valley becomes almost glacial, as in U shaped. The swallows who had made it this far seemed to have the very best of the English summer. I can’t see a swallow without feeling happier. The multitudes of them up here were a continuous pleasure. A policeman calls on the last farm. There’s no sign of arrest or investigation. A cup of tea and a talk about stocking levels I’ll be bound. Near the top we start to get the false summits. It’s taking me an age but I’m as happy pushing a bicycle up this hill as I’d be doing anything else. The really steep bits are real stings in the tail but the eventual views are breathtaking. For the last half hour one of the three peaks has been looming closer and closer. I don’t know which one. 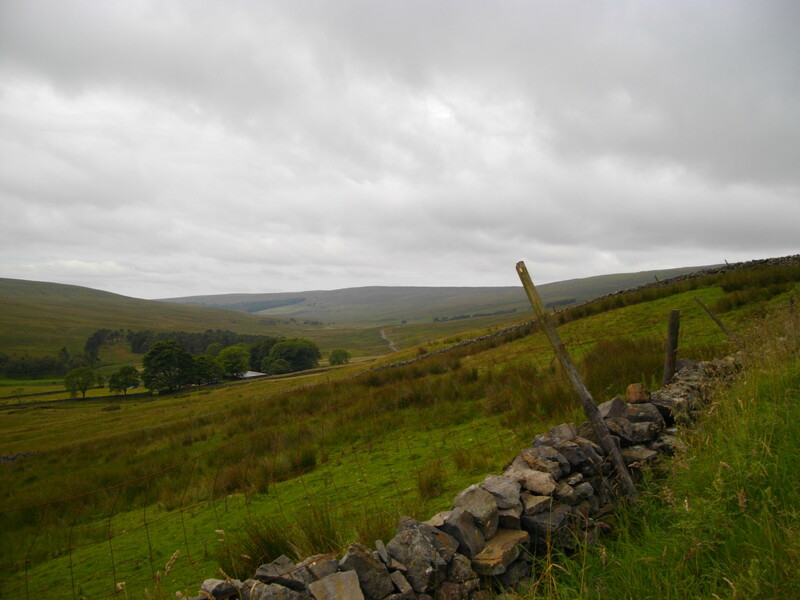 By the time you reach the top, Wharfedale is gone and Wensleydale spreads its beauty from horizon to horizon. The decent is too good to waste. Cheese and dairies have made this valley famous and the dairy herds extend a long way up. Shippens and byres are found much higher than I expected. And they’re still in use. The smell of fresh cow manure attests to that. Around the farm gates it gives the tarmac a protective covering. Well, not that protective. There’s something in cow dung that levers the macadam from the road. the potholes that this causes keeps a cyclist like me honest. 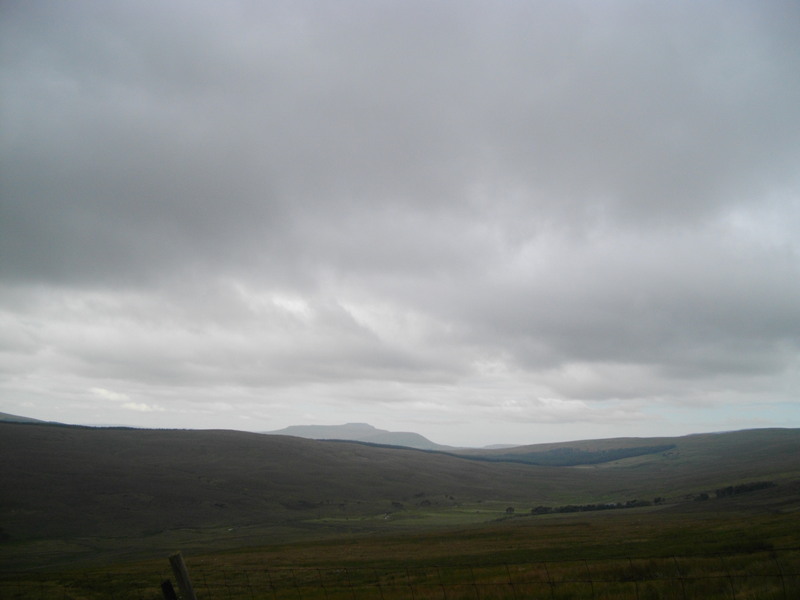 It had taken me hours to gain the ascent and less than twenty minutes (without rushing) to drop down into Hawes. I’m revived and refreshed as I re-enter another town I got to know pretty well when I was so much younger and knew so much more than I do now. I padlock the bike to a rail and wander slowly round. 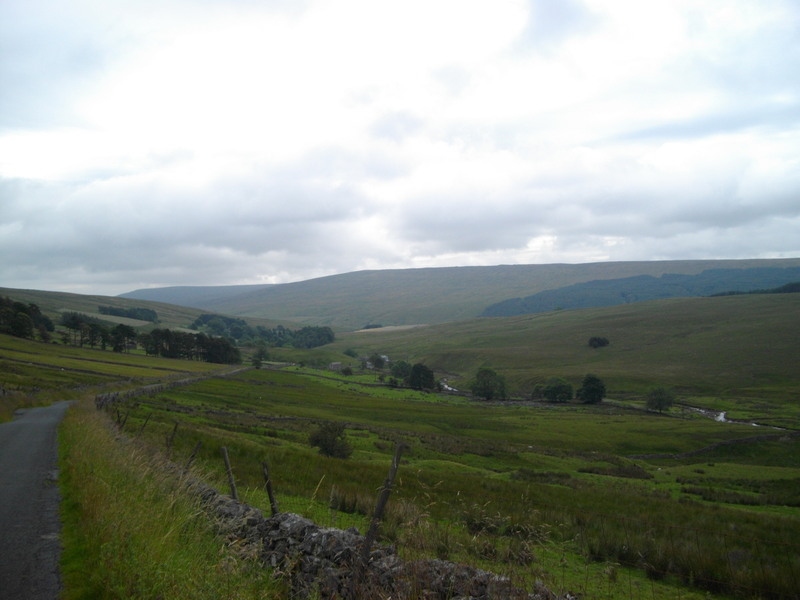 It all seems so long ago and far away where Haworth and Kettlewell came back in a rush. 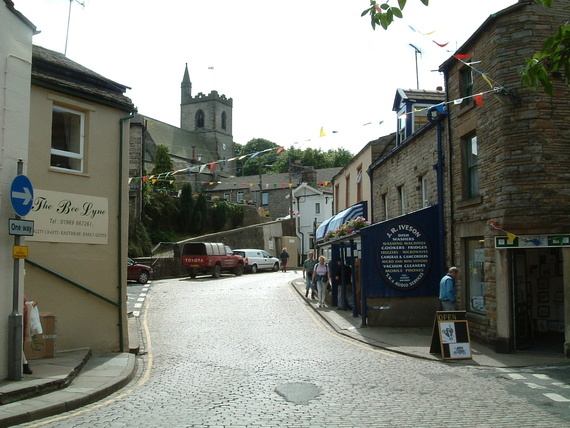 It’s a tough as teak little town is Hawes. It’s resurrected itself from near economic disaster when one of the big dairies closed down the Wensleydale cheese factory. The locals bought it, opened it up again and in doing so almost single handedly resurrected the British cheese industry. We’ve always made good stilton and sold it around the world but our pride and joy were always the everyday cheeses, each of which is named after a geographical location, even though the cheese may be made anywhere but there. Stilton is such a cheese. It’s made In the Vale of Belvoir (pronounced Beaver). the best stilton was made in Hartington in Derbyshire but this plant has had a troubled recent history. The Hawes Dairy started making Wensleydale in the proper way. The big dairies care for profits and unit sales and having the name seems enough for them. 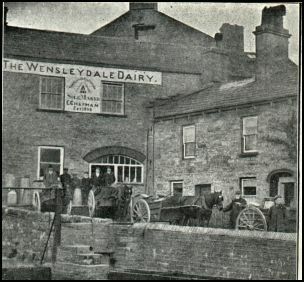 In Hawes, the cheese makers restored the traditions that made Wensleydale one of the finest cheeses. The example was followed across the country and it is now possible to get really good Lancashire, Cheshire, Double Gloucester and Red Leicester cheeses as well as Cheddars to rank against anything other countries can produce. You can still get the mass produced versions of these and if you don’t shop around this is what you’ll end up with. Thanks to Hawes though, English cheese is once more on a high.